Honda has introduced the Concept D at Auto Shanghai 2015, following the release of a teaser image late March. It likely serves as a sneak preview for a China-only crossover with a bold design and probably targeting a young crowd. The front fascia is a bit busy with that huge grille, massive vents and a large bumper incorporating strips of daytime running lights using LED technology just like the futuristic slim headlights. The side profile is also a bit on the bulky side with those oversized skirts and bulging wheel arches while instead of conventional mirrors it has received cameras. The rear end hosts C-shaped LED taillights and a roof-mounted spoiler together with an angular rear bumper also packing big air breathers. Sitting on massive 21-inch wheels shod in 285/45 tires, the Honda Concept D wears a bronze paint and has been fitted with recessed door handles while details about the powertrain are not available at this point. However, this is most likely an electric vehicle as it doesn't seem to have an exhaust tip. 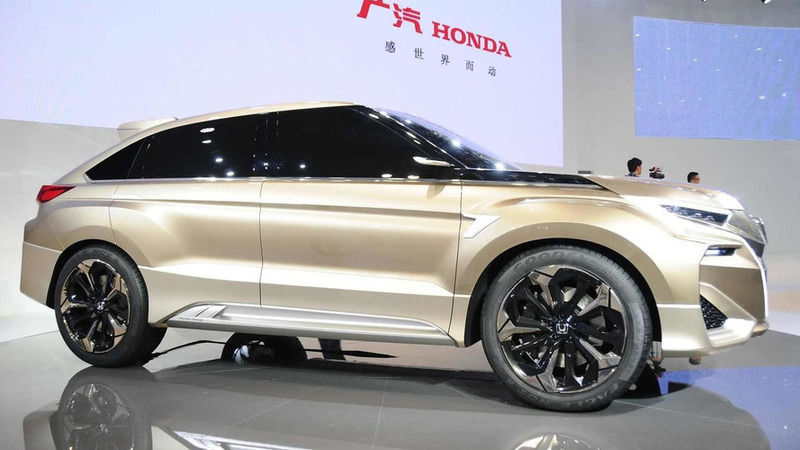 Honda says the concept previews a production SUV scheduled to go on sale exclusively in China where it will act as the company's flagship model and is going to feature "advanced safety technologies and other advanced features."